In Buffalo, Hair Removal is provided by the Aesthetic Associates Centre to reduce hair in areas of the face, armpits (axilla), body, bikini, legs and back. The newest, State-of-the-Art device for laser hair removal/reduction is the Diolux laser by Emvera. This Rapid HR (hair removal) device has minimal discomfort due to its high energy, short pulse treatment. Watch the video interview of Dr. Shatkin below. 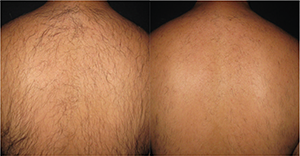 Dr. Shatkin calls this laser Rapid HR, or rapid hair removal. Instead of taking nearly an hour to do a large area of the body it takes only minutes! The short time will allow you to do the treatments on a lunch bread and be back to work in minutes! In addition, this laser is comfortable does not require any numbing cream. In fact, we don’t even recommend using numbing cream. What is the Rapid HR Diolux? The Emvera Diolux is a state-of-the-art, gold standard laser for hair reduction, permanent hair reduction and treatment of benign vascular and pigmented lesions. The Diolux features a variable pulse mode to treat all skin types, and offers safe and effective treatment with less pain and much faster speeds than traditional lasers. The Diolux provides high power, high speed and a wide, spot-size application not available with previous equipment. Once you have completed the series of treatments, you will reduce the need for shaving at home! No more irritation, bumps, or stubble. You skin will be smooth all of the time. Gain an even complexion and youthful appearance by revitalizing your face, neck, chest and hands with StarLux IPL Photofacial. Intense pulses of light are directed at the skin’s surface breaking up blemishes such as vascular and pigmented lesions to improve skin texture and tone. Our revolutionary non-invasive approach to healthy skin is achieved without any downtime and is more effective than microdermabrasion and chemical peels. 5-8 treatments every 3-4 weeks, occasional touch up every 6 months especially if continue sun exposure.